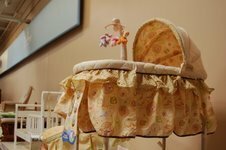 Simplicity bassinets that are still being sold at Wal-Mart and on Wal-Mart's Web site have been blamed for killing two babies. An apparently faulty frame on the Winnie the Pooh 4-in-1 Simplicity Bassinet crushed and suffocated two babies according to family members and a police report. This is the latest in a string of six deaths blamed on Simplicity baby furniture, with the previous four followed by recalls of those products. The most recent death occurred last week on Thursday when six-and-a-half-month-old Kennedy Brotherton slipped between the mattress and the side railing after the mattress came loose from the frame, her aunt, Melissa Brotherton, told ConsumerAffairs.com in a phone interview. Kennedy's body slipped through a space between the mattress and the railing until she dangled by her head on the lower bar of the railing and choked, according to Capt. Ron Copeland of the Shawnee Police Department in Kansas. "She was laughing and smiling when her parents put her to bed," Brotherton said. "They checked on her three times within an hour period. They were in the living room less than 10 feet away. She never cried." The first death occurred last fall when Katelynn Simon suffered a similar fate in the same bassinet. "The rail design allowed her to slip her legs through and as she kept inching out she slipped lower," Simon's grandmother, Lori Crammond, wrote in a complaint to ConsumerAffairs.com. "Finally, her lungs were unable to expand." The product appears to be sold exclusively at Wal-Mart and on Wal-Mart's Web site. As of yesterday, ConsumerAffairs.com found the product at two Washington, D.C.-area Wal-Marts we visited. The bassinet comes in two different Winnie the Pooh fabrics with the product identifications 3123DOH8 and 3112DOH7 and sells for between $100 and $110. Pictures of bassinets on sale at Wal-Mart. Crammond wrote that she warned Wal-Mart of the dangerous bassinet last fall. "Wal-Mart is very aware of what happened but continues to sell it with a five star rating," she wrote. Wal-Mart has not returned two requests for comment made yesterday morning and this morning. More than a million Simplicity cribs were recalled for the same reason from May 2005 to September 2007 in four separate recalls, after four children died and countless others were injured when they were trapped between the mattress and the railing. These bassinets have not been recalled. But the government agency responsible for recalling dangerous products, the Consumer Product Safety Commission (CPSC), is actively investigating the matter, said agency spokesman Scott Wolfson. "CPSC is ... aware of two tragic deaths involving babies that had been placed in Simplicity bassinets," he said. Both families said their goal is to warn as many consumers as possible. "Our main concern is to get the product recalled," Brotherton said. Simplicity products are certified by the Juvenile Products Manufacturing Association (JPMA) and these bassinets carry the association's seal. The association gave no comment on the recent allegations against Simplicity's bassinets. In a prepared response after the previous recalls, the association stated that "Simplicity's products carry the JPMA certification seal because they have passed the comprehensive and rigorous tests and review administered at our qualified independent testing lab." The prepared statement did not address the concerns of the products they endorsed, but instead seemed to blame the dangers of the products on the parents. "As with all consumer products, it's important to follow the manufacturer's assembly instructions," JPMA said in the statement. "This recall should serve as a reminder to all consumers to regularly check their cribs to ensure that they are properly assembled, and all screws and bolts are appropriately tightened. Consumers should check with manufacturers if they have any concerns about product assembly." As for Simplicity, the company appears to be out of business. A phone call to the company's headquarters was met with a prerecorded message stating "Simplicity, Inc. is no longer in business and we no longer service Simplicity, Inc. products." Two phone calls made yesterday and today and an e-mail were not returned by the company's attorney, Rick Locker, who has many clients in the child product industry. The product also is under the Baby Disney product line since the bassinet is adorned in Disney's Winnie the Pooh characters. Disney responded last night but has not returned a subsequent phone call.